Arinze Kene launches into a story about a fight on a night bus. His performance is physically and vocally rich, words rattling from him, as musicians Shiloh Coke and Adrian McLeod, on either side of the stage, provide back up. It appears we’re watching gig theatre. Kene’s performance is pulsing and potent as he paints a picture of the city as a body and its inhabitants as blood cells under attack. But, just as he’s really getting in to it, he stops. 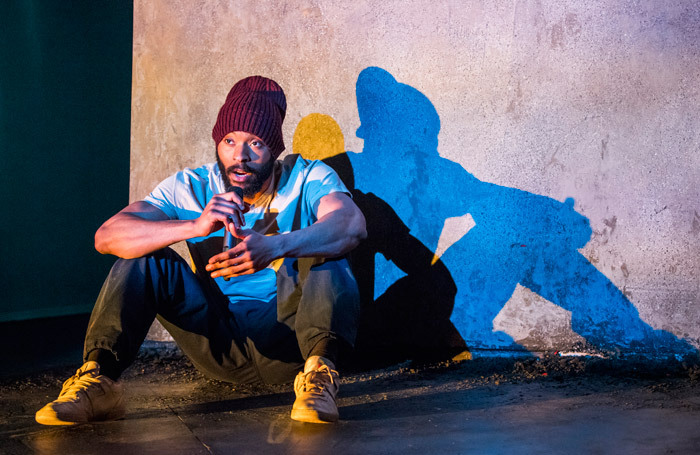 Kene’s friends – played by Coke and McLeod – chastise him for pandering to an audience “that doesn’t look like us.” They think he’s written yet another ‘urban play’ with black trauma at its heart. Producers and agents wade into the debate. Everyone has an opinion. Kene ends up tugged in several different directions. Misty is, on one level, a piece of theatre about making theatre but Russian dolled within this there’s a lot goin on here. It’s a reflection on the kind of stories that get told on our stages, who gets to tell them, why, and for whom, all filtered through the lens of a black male writer and performer. Questions nest within questions. Performative layers fall away as Kene bends the production back on itself, arguing the worth and value of seeing your lived experience up on stage. This process of interrogation is imaginatively represented in Omar Elerian’s rigorous, intelligent production by a series of orange balloons. They keep popping up. They engulf Kene, and in one stunning moment they colonise Rajha Shakiry’s set. He covers a lot of ground, probably too much for one piece – representation, gentrification, the messy intersection of the two, police brutality, Black Lives Matter. In its best moments Misty is at once a polemic, an essay and a poem, and as he proved in One Night in Miami  and Girl from the North Country, Kene is a captivating performer – spectacularly charismatic even when all but obscured by orange latex.